The "Take It!" 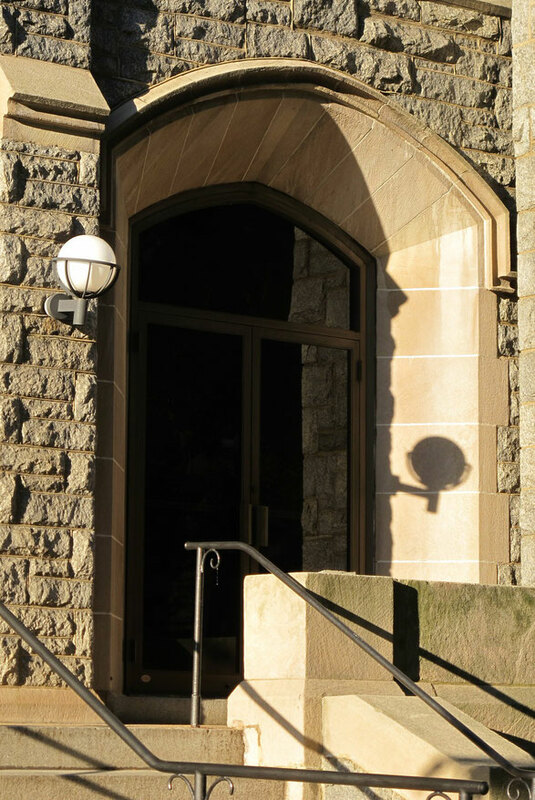 came from how distinctly the shadow was on the inset of the doorway to this massive entrance to a stone faced church. I had driven by this church many times and never looked at this before with the sun rising and casting such strong from the side illumination enabling the show. The After Take: While the light fixture is what caught my eye. Sort of the dark object of the lure, what else is offered in this picture set is to me, quite pleasing. The shadows cast from the railings offer a neat contrast, one being onto the steps resulting in the zig zag. The next railing without the steps, being a straight on the incline line. Other shadow lines all conspire to make this an easy on the eye presentation. I have the beginning of a collection of shadows cast from unlit lights. It is a constant game of staying alert to the many offerings on display every day. Thanks for joining us for the current photo presentation. You are cordially invited to return Friday, June 8th for a new picture that we hope you will enjoy. I can tell just from looking at this small section of the building it has been built with some beautiful architectural designs. Oh well ya, thats my front door... Ha ha jk, great picture as always Bruce! I agree Livin4love, I have had many occasions to visit DC. Many buildings in the city are crafted beautifully and masterfully. Your work with shadows is pretty damn impressive. Some of the Churches in DC are just gorgeous. I seem to remember someone telling me jokingly that it seemed like there were more churches in DC then there were people. Wow, people would be lucky to have their wedding photos done here! I <3 this one!!!! It's funny you should mention that Ray. 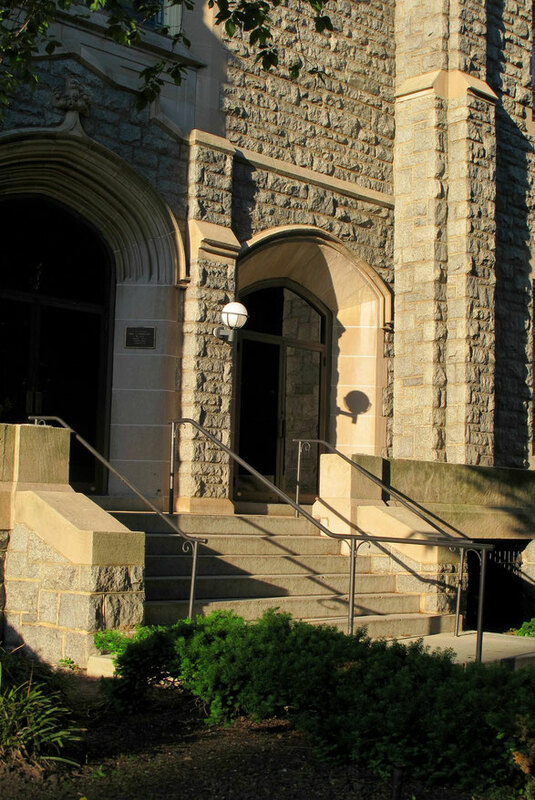 Bruce and I were once driving down a street in DC and almost every other building was a church. I spent some time laughing and commenting to him on the large amounts of churches one had to choose from. Your post really cracked me up when I read it! So it is true then. HA! What a hoot! I should give credit where credit is due, this is a great photo Bruce! Your hard work really shows here. I agree Sarah, this would be an amazing backdrop for a wedding photo. I approve of your message Jeff. +1 from me! Very nice pic! I bet the building is beautiful. dang after a few weeks of not comin here i missed out on alot. really cool though to be able to kill an hour between classes checkin out ur pictures. thanks for makin time fly!!!!!!!!!!!!!!!!!!! I am most appreciative of you all taking the time to visit the site and am humbled by your kind comments. So many of my photos find the subject being the star; I am ever so fortunate to be given the gift of being able to take these pictures. Thank you all and very best wishes.